There are so many ingredients in DIY face scrubs (like essential oils) that people tell us to get if we want amazing skin. But if we go with what they tell us to buy, things can start to get pretty expensive when making a scrub. Thankfully there’s no need to go to the store if you already have the ingredients for one in your own home. I remember when a friend of mine was talking all about the benefits of face and body scrubs for your skin and I asked her for an example of one I could make. There were only two ingredients and I already had them in my cupboard. There was no need to rush to the beauty store and spend a lot of money. So after a couple of years of experimenting with scrubs, I’ve created a list of ingredients that you can find in your own home without having to go out, spend your money, and hope that it does your skin justice. You eat oatmeal in the morning (or at least sometimes)? Good, now you can walk to your kitchen, take it out of your cupboard, and use it as a scrub. It turns out that oatmeal isn’t just good for your internal health, it’s actually great for skincare as well. Oatmeal helps to fight against bacterial infections on your skin (which means less breakouts for you!). It’s also a skin lightener, so if you have any scars and blotchy areas, you can apply an oatmeal scrub to make your tone more even and reduce darker spots. Definitely something you want to stock in your bathroom, not just your kitchen. If you’re an avid coffee drinker, then this ingredient will probably be in your cupboard. Coffee has a ton of antioxidants in it that help to fight against cancer cells and free radicals (free radicals help to age your skin). And when you scrub all of the dead skin cells and dirt off (as with many scrubs), it lets all of the antioxidants into your skin. Coffee can also do a couple more things for you skin. It helps to tighten your skin because the caffeine in the coffee constricts blood vessels in your skin AND it reduces the appearance of cellulite! I knew coffee was good for something more than just drinking! Sugar was my first go-to scrub ingredient. There was plenty of it in my kitchen, so I didn’t feel like I was wasting any money. Now while sugar may not be that great for you to eat, it definitely has some great benefits for your skin. Sugar helps to pull moisture from the air, therefore giving you more hydrated skin. Also, because of certain properties in sugar, it helps cell turnover, which means old cells with skin damage get replaced with new healthy cells. Definitely a reason to keep sugar in the bathroom and not just in your kitchen. 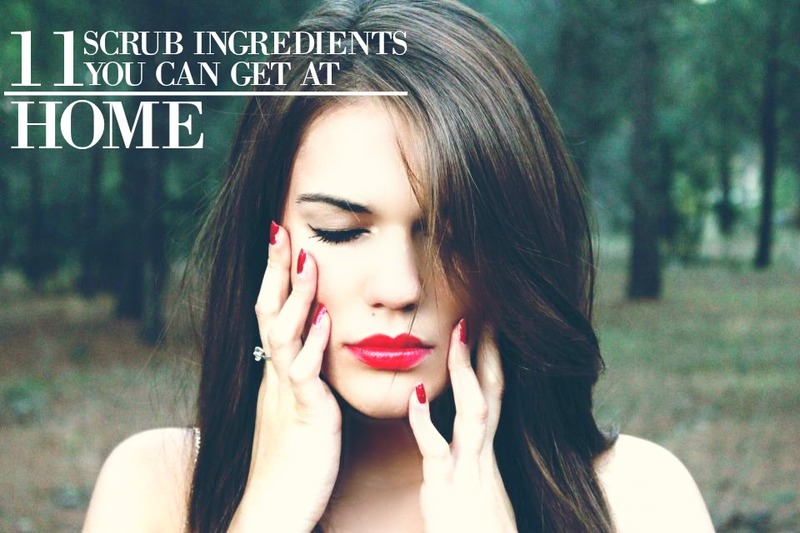 Table salt is also any easy go-to when it comes to face scrub options. Almost everyone cooks with it, so all you have to do is steal some from your kitchen stash. Take note that because of the way table salt is processed, it’s stripped of all of its beneficial elements. So if you don’t just want an exfoliater, then definitely think about using Epsom or sea salt if you have any in your home. Epsom and sea salt have almost all of the same properties. They both help to eliminate toxins from the body, relax your muscles, and help retain fluid in the skin (which is great for having youthful skin). Baking soda is something many people use in their cooking, but they probably don’t know that it can be used for something other than making cookies. Baking soda is great for the skin for a few reason. The first being that it has a good alkaline level which means it will help reduce inflammation in your skin and calm it. The second is that it helps to fight bacteria, so if you’re prone to breakouts, then this awesome for you. And lastly, its more of a fine scrub than the others, which means it’s gentler on your skin (gives you less irritation), and reduced the appearance of scars over time. As I mentioned before, sugar was my first go-to scrub, and olive oil was what I paired it with. When I used olive oil as apart of my face and body scrub, I could definitely feel how much smoother and softer my skin was. While being an awesome moisturizer, olive oil has amazing antioxidants, the kind that fight against free radicals that age skin, and heal scar tissue. And while it may be a bit thick, it doesn’t clog pores (so for those of you who get breakouts, this one is safe for you). We’ve all heard of how coconut oil is amazing for you, and if you’re someone that keeps it in your kitchen for cooking, then you’re in luck. If it’s in stock, coconut oil is a great way to help keep your outer and inner health going strong. Coconut oil is great for moisturizing your skin and because of its fatty acids and proteins, it helps to keep your skin looking young and fresh. It also has anti-bacterial properties which help to prevent breakouts from happening, so you can keep clear skin throughout the day. And lastly, it’s great for healing any scar tissue you may have. Quick and simple, canola oil is primarily great for moisturizing your skin. So if you don’t have olive or coconut oil, then this is a good go-to that gives you healthy soft skin (it also doesn’t clog pores, so no breakouts for you). It’s been debated as to whether there are any other benefits to the oil (antioxidants and fatty acids), but it’s safe to say for now that its good to use if you’re in need of a moisturizer. Whenever I see vegetable oil in the store, it’s usually done by Crisco (I’m sure it doesn’t matter the brand). And while its ingredients are processed, with a little research, I’ve found that their vegetable oil is a great moisturizers for you skin. Said to work better than regular lotions, it’s an awesome option if you want soft skin. And it’s been said to help reduce fine lines on the face as well. As I’ve said before, a lot of face and body scrub ingredients can be pretty expensive. Thankfully, there are plenty of scrubs and oils we can use around our house to take care of our skin without investing too much money into something that might work. Just make sure that you apply to your face or body in a small selected area (when it comes to the oils) first. Because while many of these oils won’t cause you to have a breakout, it’s good to make sure that you don’t use something that will affect you badly. Now I hope this post was helpful for you, but if there was something I missed, email me or let me know in the comments! I might just add it!